The southwest of the island of Lanzarote in the Canary Islands brings to mind the surface of an alien planet, covered in lava fields and dozens of volcanic cones. You half expect to find a film crew shooting a science-fiction movie. Walking on Lanzarote doesn’t get much better than this. Lanzarote itself was created from the emergence of underwater volcanoes millions of years ago. 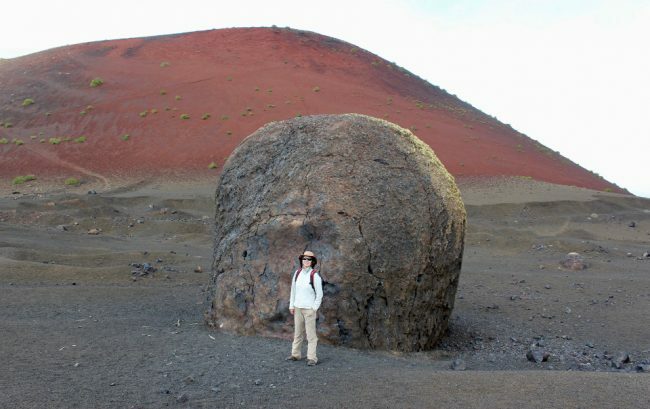 The more recent volcanic eruptions, from 1730 to 1736 (as well as a shorter episode in 1824) added 32 new volcanoes to the landscape, creating what is now Timanfaya National Park, and neighbouring Parque Natural de Los Volcanes. 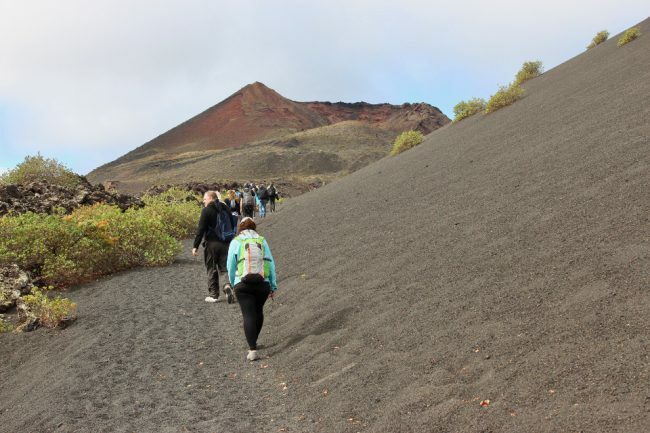 The latter is where Eco-Insider was taking our group of 16 for a day hike around, up to, and into, three different volcanic cones. 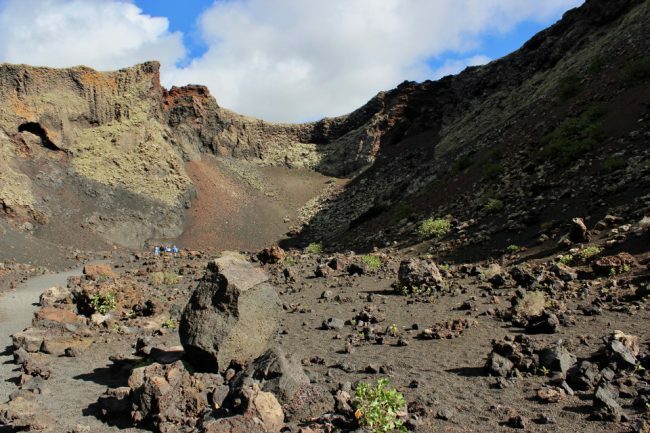 I booked the tour called 3-Volcanoes Guided Walking Tour from Lanzarote through Viator, which handpicks and sells tours and activities from hundreds of pre-vetted providers all over the world. 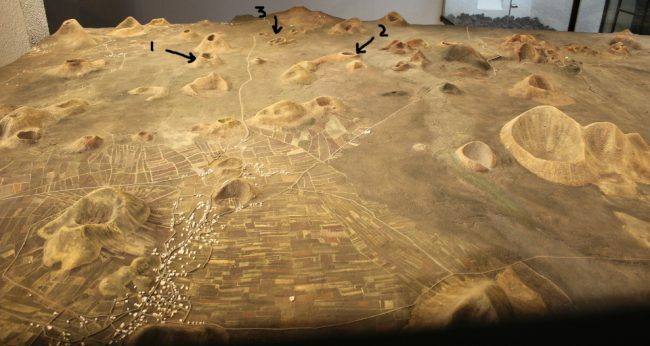 A model of Parque Natural de los Volcanes. Arrows indicate the three volcanoes on our walk. Alena, one of our three guides, picked me up from my hotel in Arrecife (the capital). After driving for half an hour or so, we met up with the rest of the group at the Visitor Centre of the Parque Natural de los Volcanes, the site of an interesting museum explaining the geology and volcano formation in the area. The museum tour started with a “simulation” to give us an idea of the level of noise and vibrations that the local people had to live with for six long years while their side of the island was transformed before their very eyes. Sara, our second guide, explained that the volcanoes that erupted here were mostly of the “effusive” type (as opposed to “explosive”) with slow flowing magma. After our short museum visit, we got back into our vehicles (one minivan and two 4×4 jeeps) to begin our exploration of the park. First up was an easy stroll around part of the base of a rust-coloured volcano, one of the last to erupt during the volcanic activity of 1730-36. The reddish colour is due to oxidized iron among the silicate. While following the dirt trail, Alena explained that the lichen are the first plants to appear on the volcanic rocks covering the ground. On Lanzarote, where there is little humidity, even this simple plant takes hundreds of years to develop. Other rocks found on the ground include pumice (very light because of all the air bubbles), basalt, and olivine (mostly as inclusions in other rocks). Just before turning back, we came upon a “volcanic bomb”, a large rock blown out from one of the volcanoes. 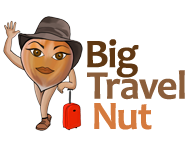 Measuring 5 metre tall and 4 metre across, it is considered one of the biggest in the world! Before making our way to our second stop, everyone squeezed into the two jeeps, as 4×4 vehicles would really be needed on the upcoming potholed trail. 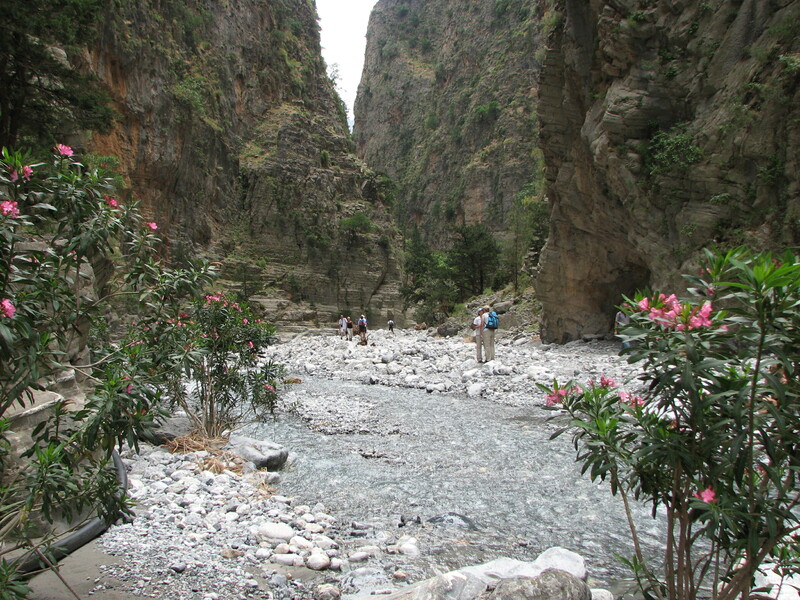 We were going to hike along and up to the crater of La Rilla, a low, cylindrical and symmetrical volcano. Just as we got out of the jeeps, drizzly rain and cold winds welcomed us. Fortunately, they were short lived, and the vegetation can certainly use the water. As a matter of fact, there were more plants growing along this route. Some were introduced to feed imported animals like goats and camels. Alena told us that the only native animals here are the bat and the shrew. This walk was mostly on flat or gently sloping ground, but the loose fine pebbles sometimes made us feel like we were walking through soft snow. A few minutes of a steeper climb, and we arrived at the edge of the crater, a perfect bowl of brown and red earth, speckled with hardy tufts of vegetation. From up here, we could see the south, east, and west coasts of the island all at once. Before driving to our third and last stop, Sara distributed some egg and veggie sandwiches to replenish our energy. The picnic also included local bananas and bottled water. Meaning “volcano of the raven”, Volcán del Cuervo was the first volcano to erupt in 1730. Its form is very distinctive, due to the crater that collapsed on one side. This let the lava that had accumulated into a “lake” at the bottom, escape. Because of this feature, we were able to walk right into the volcano crater, where berbery falcons are sometimes seen. We didn’t spot any birds, but I found this volcano the most beautiful and interesting of the three. Rocks in shades of black, brown, red, and yellow covered the crater walls, while bright green plants grew sparsely at the bottom. The sun, which was missing earlier in the day, finally made an appearance. Although local buses travel to many towns and villages on Lanzarote, you’ll need a car to reach Timanfaya and the Parque Natural de Los Volcanes. 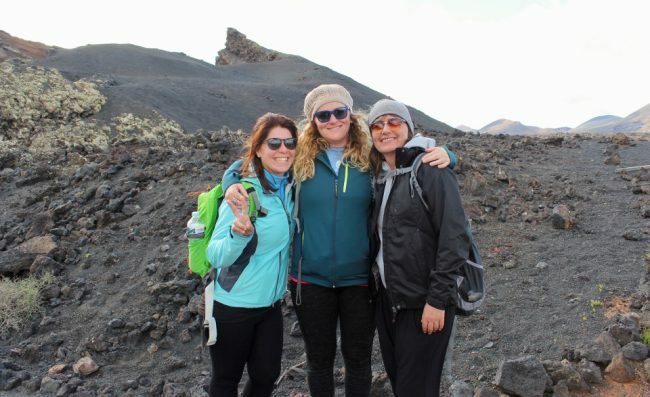 Timanfaya is tightly controlled, and you must join a bus tour from the Visitor Centre to visit it. Guided walking tours are offered by the park rangers, but you must also arrange these in advance. It is not possible to hike in the park independently. Parque Natural de los Volcanes, on the other hand, can be visited on your own if you have a vehicle, but you should stop by the Visitor Centre first to get information and maps, check if you need any special permit, and register with them. By joining a tour such as Eco-Insider’s, you don’t need to rent a car and don’t have to worry about finding your way around. (It’s a BIG park.) You also get added value from the guides who provide a lot of detailed information on the geology, flora, and fauna of this area. Since the tour costs only 42 Euros, this is a no brainer for solo travellers. The walking is pretty easy and totals about six kilometres. This tour is ideal for people of all fitness levels who want a low intensity walk with plenty of stops where they get to learn about the dramatic scenery surrounding them. Although the tour description talks about a five-hour walking tour, the addition of the driving time and museum visit make it more like seven hours. We left Arrecife a little after 9:00 AM and were not back before 4:00 PM. You can also be picked up from one of the nearby resorts. You’ll require hiking shoes (or at the very least trainers) and need to be prepared for all kinds of weather on this hike. We got sunshine, rain (more of a drizzle really), and cold winds. All in all, it was an excellent day and a unique experience which I totally recommend. Note: I was hosted by Viator on the 3-volcanoes guided walking tour from Lanzarote. However, all opinions are my own.